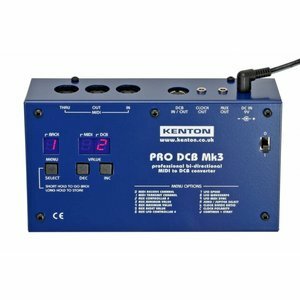 The Kenton Pro DCB is a very comprehensive, fully programmable interface for MIDI-fying your Roland Juno 60 (and some Jupiter 8s) by the use of their DCB interface socket. It comes with a cable with a 14 pin connector which works with all Juno-60s and SOME Jupiter 8s. 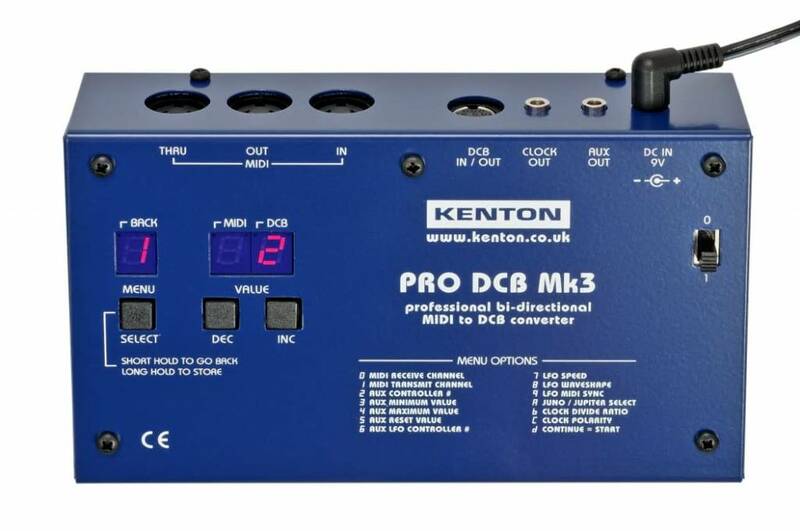 It works bi-directionally which means your instrument can not only receive but also transmit MIDI messages! DCB was a digital control bus that Roland introduced before MIDI and built only in few units( Juno-60, Jupiter 8a and two sequencers). DCB sends and transmits note on/off messages and program changes, similar to MIDI. The Pro DCB can convert this messages which makes it an easy task to add MIDI to your synth! The interface works bi-directionally i.e it can receive MIDI but on the other hand you can generate MIDI messages with the keyboard. Transmitting and receiving can happen on different MIDI channels (1-16). The AUX socket outputs a control voltage which corresponds to a MIDI controller and is to be used for modulationf the cutoff frequency (or the Jupiter´s VCA). PitchBend, Velocity, Aftertouch and MIDI controllers 0-120 can be converted. Minimal and maximal voltage values can be set in the Pro DCB. The unit also has an internal LFO that can be synchronised to MIDI and it´s ouput at the AUX socket. The clock output is connected to you synth´s Arpeggio Clock Input which makes it possible to sync the arpeggiator to the MIDI clock. :) The unit offered here contains a 1.8m long cable with a 14 pin DCB connector. This plug fits all Juno-60 synths and SOME Jupiter 8s so check the number of pins on your synth´s DCB socket before purchasing. Some Jupiter 8s had a 20 pin connector, in this case take the other version with the 20 pin cable.